Nearly a thousand people are still unaccounted for following the Camp wildfire. Authorities still consider the list to be somewhat raw as hundreds are just now starting to move out of unofficial shelters. First, his department is now receiving more reports of people who are missing and who are safe. Second, there could be duplicate names on the list. And third, pop-up evacuation centers – the ones not coordinated by officials – may not all be communicating the names of people they’re hosting. “If they’re not part of that county system, then it creates that kind of difficulty,” Honea said. Hundreds remained in tents and vehicles over the weekend at unsanctioned camps adjacent to a Walmart in Chico and on landscaping in front of a nearby Lowe’s. They were told food and clothing distribution, being done by volunteers, would wrap up Sunday. Officials are pondering how and where to house evacuees through a reconstruction period likely to take years. It’s far from clear where all the new shelters will be, and what type of housing they’ll provide. Chico City Manager Mark Orme said one option is trailers. Leticia Buitron of Sacramento, who has been helping on her own all week, shepherded evacuees to an official shelter location in Yuba City. She said some are reluctant to leave. Some of the unofficial shelters have been working to share information with authorities. The makeshift shelter at Pleasant Valley Baptist Church, which closed Sunday, has been sharing names with the county. Pastor Tim Ruhl said while they were open, they kept track of the roughly 300 people who were staying there. This week the American Red Cross began sending out teams of volunteers throughout Chico in search of people who could be marked off of the missing persons list. 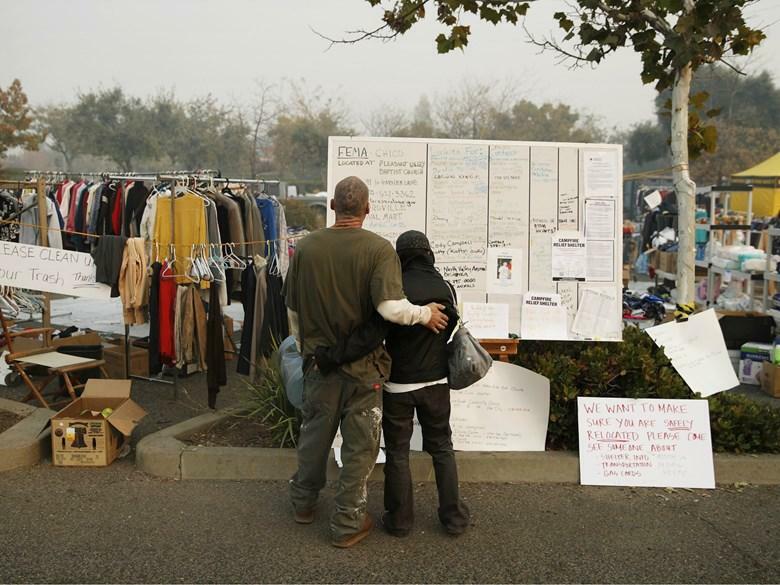 As pop-up shelters begin to close and evacuees are moved to county-coordinated shelters, officials hope to have another chance to cross-check names and start bringing the number back down.